Local product Andrew Wenger didn’t waste much time making an impact. 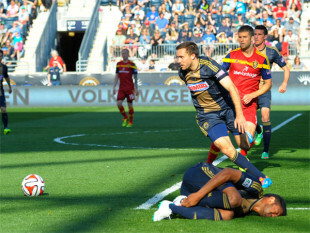 Wenger netted his first goal in his debut for Philadelphia Union in Saturday’s draw to Real Salt Lake. After making a great run to the back post, Vincent Nogueira served up a beautiful ball to Wenger, who calmly took it down and placed it past the keeper. The swap of Wenger for McInerney appeared to pay off, as it was an overall strong performance from Wenger, who was acquired from Montreal in a trade for Jack McInerney. As a reminder of just how local Wenger is, on Sunday, he was at the Angelo’s Soccer Lancaster location for an in-store appearance. He used to work there. Meanwhile, Zach Pfeffer and Zack Steffen are down in Dallas this week representing the U20 Men’s National team at the 35th annual Dallas Cup. On Sunday evening, the squad, with Steffen in net, took down Argentinean club Atletico River Plate in a 3-2 victory. On Monday, the team defeated Eintracht Frankfurt 3-0. Pfeffer assisted the first goal and tallied the second. The squad is looking to become the first U.S. team to win the Dallas Cup Super Group in eight years and next faces Chivas de Guadalajara. Finally, although not a Philly native, recently traded Union striker Jack McInerney is off to a good start in Montreal. After a choppy first half, Jack found the back of the net right before the halftime whistle to give his team the lead. Chicago would ultimately end up equalizing early in the second and the match would end in a draw. Bobby Convey, D/M, New York Red Bulls —Did not play in Saturday’s Loss. League: 5 games. Dan Gargan, D, LA Galaxy — Started and played 90 minutes in Saturday’s 1-0 win against Vancouver. League: 3 games. Antoine Hoppenot, F, Philadelphia Union — Played 4 minutes in Saturday’s draw to Real Salt Lake. League: 6 games. David Horst, D, Houston Dynamo — Did not play in Saturday’s loss. League: 4 Games. Jeff Larentowicz, M, Chicago Fire — Got off 4 shots and played 90 minutes in Saturday’s 1-1 draw to Montreal. League: 5 games, 5 starts, 2 goals. Steve Neumann, M/F, New England Revolution — Did not play in Saturday’s win. League: 1 game. Jeff Parke, D, DC United — Started and played 90 minutes in Saturday’s 1-0 win over New York. League: 5 games. Zach Pfeffer, M, Philadelphia Union — Did not play in Saturday’s draw. League: 0 games. Ryan Richter, D, Toronto FC — Did not play in Saturday’s loss. League: 0 games. Billy Schuler, M/F, San Jose Earthquakes — Did not play in Sunday’s draw. League: 0 games. Andrew Wenger, F, Philadelphia Union — Played 86 minutes and scored in Saturday’s 2-2 draw to Real Salt Lake. League: 5 games. Tony Donatelli, M, Ottawa Fury F.C. — Played 14 minutes in Saturday’s loss to Fort Lauderdale . League: 1 game. Hunter Gorskie, D, New York Cosmos – Did not play in Sunday’s game. League: 0 games. Jimmy Ockford, D, New York Cosmos — Did not play in Sunday’s game. League: 0 games. Jeremy Vuolo, GK, San Antonio Scorpions — Did not play in Saturday’s loss. League: 0 games. Danny DiPrima, M, Harrisburg City Islanders — No game this week. League: 0 games. Ryan Finley, F, Dayton Dutch Lions — Did not play in Friday’s draw. League: 0 games. Cristhian Hernandez, M, Harrisburg City Islanders — No game this week. League: 1 game. Corey Hertzog, F, Orlando City —Played 61 minutes with one shot in Saturday’s 1-0 win. League: 3 games. Morgan Langley, M/F, Harrisburg City Islanders — No game this week. League: 1 game. John McCarthy, GK, Rochester Rhinos — Did not play in Friday’s game. League: 0 games. Jimmy McLaughlin, M, Harrisburg City Islanders — No game this week. MLS: 1 game. Jason Pelletier, M/F, Harrisburg City Islanders — No game this week. League: 1 game. Garrett Pettis, F, Harrisburg City Islanders – No game this week. League: 0 games. Andrew Welker, F, Harrisburg City Islanders — No game this week. League: 0 games. Jason Yeisley, F, Richmond Kickers — Did not play in Saturday’s loss. League: 0 games. Colin Zizzi, D, Harrisburg City Islanders — No game this week. League: 0 games. Eddie Gustafsson, GK, Red Bull Salzburg — Did not play in Saturday’s win. League: 0 games. Alex DeJohn, D, TPS — Played 90 minutes in Saturday’s loss to FC Honka. League: 0 games. Zarek Valentin, D, FK Bodø/Glimt — No game this week. Suffered an ACL injury that will likely end his season. League: 2 games. Bobby Warshaw, M, GAIS — Did not play in Sunday’s win. League: 0 games.